Much-missed Community Class teacher Jah Spirit, former MIH project manager Caroline Rognon and Community Class teacher Ogu Nnachi participate in a gozleme class. Photography: Tanya Harris. How times have changed. A study by leading researchers Ipsos MORI showed that just over half million Brits were following a vegan diet, a surge of over 350% since the estimate of 150,000 ten years before that.That was 2016. Lord knows what the figures are after this year’s Veganuary, a success story in its own right, for which 115,000 people registered. But plant-based eating isn't the only way Made in Hackney has been forging new paths. Founded on four pillars of impact - health and wellbeing, environment and community - the project aims to help people, often those most in need, lead happier, healthier, more connected, environmentally sustainable lives. It does this through food: fun, supportive, courses in local food growing, in cooking, in composting and more. In sessions called Cooking for Life, International Cuisine, Healthy Baking and Fifteen Minute Meals, learners develop practical skills to feed themselves and their families as healthily and ethically as budgets allow. So far, the project has worked with over 6,000 people; 2,500 in 2017. The stats speak for themselves: 98 per cent surveyed said that their class had encouraged them to eat more healthily; 93 per cent now eat less processed food. One hundred per cent were inspired to cook from scratch. Ninety three per cent said they felt more connected to their local area. While students are cooking, there’s plenty of chances to talk about the wider world and about how food choices can help influence global issues. And, because issues are shared in a busy, happy kitchen, difficult subjects become simultaneously less remote - and less intractable. For Sarah, approach is key. 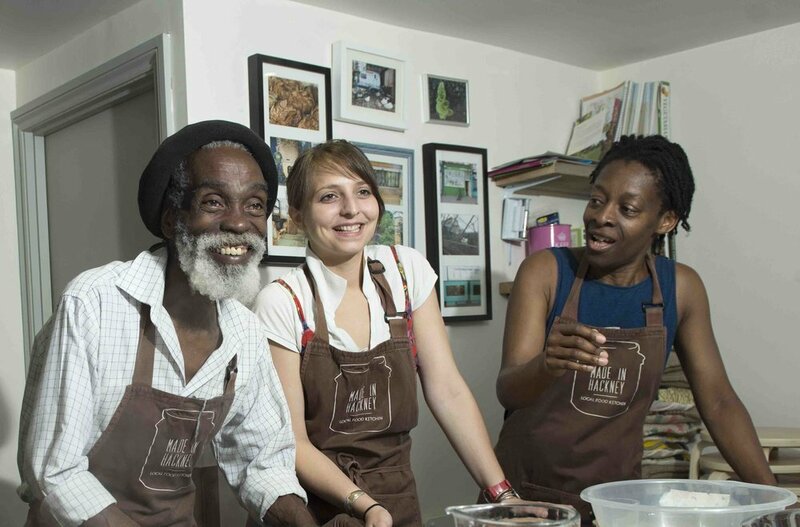 Joyous and playful, Made in Hackney's activities build on the power of food to nurture, not just physically but emotionally. You know how everyone gathers in the kitchen during parties? 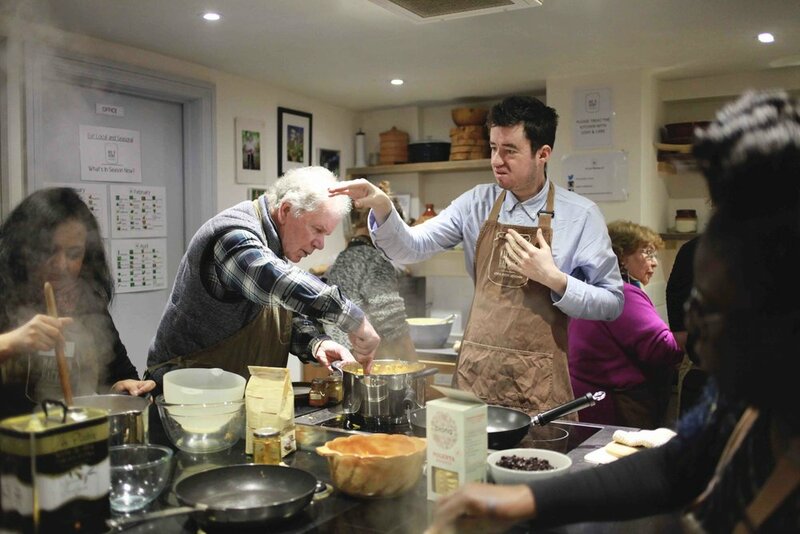 That’s what it’s like at Made in Hackney - only you’re learning about food and the world. Powered by its dedicated staff and volunteers (100 on the books, 40 active at any one time; two on every course “to make sure no one gets left behind because they’ve forgotten their glasses”), Made in Hackney works with local groups to make sure those most in need get first dibs at the charity’s community classes. From low income families to stroke survivors, from children in care to teen carers, all are welcome. “If we’re booking 12 places, 9 places might go to those in need,” explains Sarah. “Then we open it up to everyone else. So you might get an architect, a GP, a fashion students with some fellows from the homeless shelter and some mums from the Muslim Cultural Centre. The result is a real sense of community. “People come back,” says Sarah, proudly. “We might not see them for a year - and then they pop up.” As evidence of the sense of belonging Made in Hackney can generate, last year’s summer party numbered a buzzy 200. How has the project changed during its lifetime? “In terms of our three pillars - health and wellbeing, environment, community - we’ve solidly stuck by that,” says Sarah. But it is in terms of scope, of numbers reached and of influence that the project has gone far beyond expectations. The Made in Hackney team are frequently asked to give talks, most notably at recent vegan festival Vevolution and at TED, and to share knowledge with like-minded organisations. What gives her hope? “Children,” she says, emphatically. “If you explain to them what’s going on, they have an innate sense of justice and wanting to fix it.” She pauses - and adds: “And all the grassroots organisations around the world doing something to challenge things.” Made in Hackney is firmly in that group.